Cody Webb leads at SoCal Vista on the a.m. loop. Race leaders approaching checkpoint B on the a.m. loop. Jimmy Lewis, the Godfather of King of the Motos, was not happy. You guys are in the wrong place. You need to get down that hill right now. So off we went, running, leaping and rolling down into a steep canyon, trying to race the dust and noise of approaching riders to a checkpoint they were not supposed to arrive at for another 40 minutes. I rolled end-over-end the last few yards down a sand hill onto the course just as the leaders flew by. Made it with at least 1/10 of a second to spare. King of the Motos, now in it's third year, is the most ambitious hard enduro in the United States. 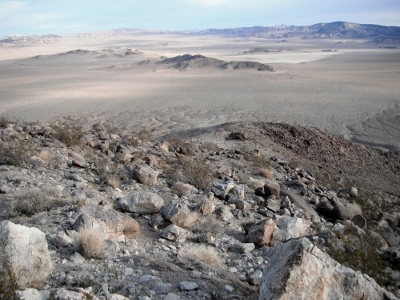 KOM kicks off the King of the Hammers, an enormous, week-long off road race run each February at the the Johnson Valley OHV area, located in the high California desert about 70 miles east of Los Angeles. 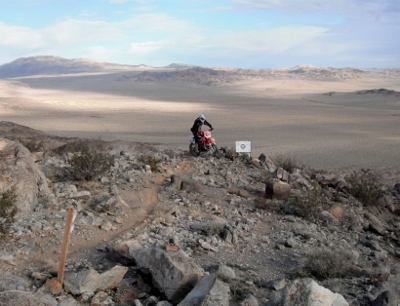 A few years ago, Jimmy convinced the somewhat skeptical organizers of the King of the Hammers to allow him to incorporate a motorcycle enduro over same terrain used by rock crawlers, trucks and jeeps. Fortunately, Dave Cole, the organizer of the Hammers, was willing to listen to Jimmy's pitch. That's pretty much how one of the most exciting events in off-road racing was born. This was my second year at KOM as a course worker. King of the Motos is a huge undertaking, and difficult to staff at the levels that Jimmy would probably like (I suspect that some of this might have to do with the fact that it's held on Superbowl Sunday). KOM is a breathtakingly complex event that is probably as hard to manage as it is to ride - and that's saying something. This year's format, a Saturday qualifying round, and two loops on race day, upped the ante from the previous year. After the 2013 KOM, which involved a course that I thought was insane enough for most anyone, I came across some web chatter to the effect that while OK by American standards, KOM was not up to world class, especially by European standards. I'm reasonably sure that Jimmy encountered the same cack, and that it may have been on his mind as he planned the 2014 course. I have never seen anything like the two loops for this year's event. Neither, as it turns out, had many of the riders. This placid scene belies a monster climb. Everyone who made it to checkpoint B on the a.m. loop before it closed. I arrived in Hammertown on Thursday evening and found out that we'd be gathering at the crack of dawn on Friday morning to sort out assignments. The crack of dawn didn't exactly work out, but it was still early and colder than one might expect when I got, from Jimmy, the GPS coordinates and maps to the two checkpoints I'd be responsible for. The job for the next two days was simple: to figure out a way to get to each checkpoint, and to make sure that I could get from my checkpoint on the a.m. loop to my checkpoint on the p.m. loop in time. My checkpoint for the afternoon loop was just a few miles from Hammertown. 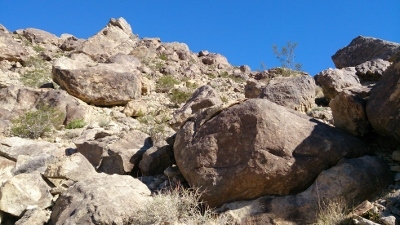 I had to do some hiking to get there, but I managed to eventually find the spot. Arriving back at Hammertown at noon, I hooked up with a larger group who were heading out to find various a.m. loop checkpoints. 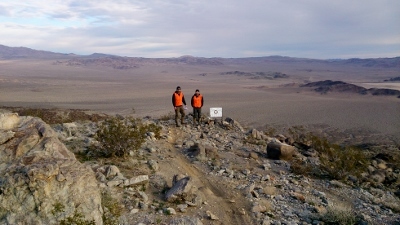 This group ride turned out to be quite the adventure, but I eventually did find my checkpoint after riding enjoying a larger-than-anticipated sampling of Johnson Valley's finest vistas. Saturday's goal was to make sure that I could get from one checkpoint to the other in time. In a practice run, I was able to easily make the transit in a about 90 minutes. Piece of cake, or so I thought. There was a small amount of confusion about exactly who was supposed to staff checkpoints 4 and 5 on the p.m. loop come race day. I knew that I was working #4, but not exactly sure who I'd be there with. I also needed to recruit some help for my a.m. checkpoint as we were short on course workers. I found a couple of willing hands in Jeff and Russ - a pair of amiable young gents who'd driven all the way down from Seattle in an ancient mini-motorhome to support a buddy who decided to go way big for his first ever race. They'd work the a.m. loop with me, then tag along to help out on the p.m. loop. Official vid from the KOH folks. Approaching checkpoint 4 on the p.m. loop. Saturday night we had our course worker meeting Jimmy had everything pretty well organized. I got two packets, one for each checkpoint, a radio and a race schedule. On each packet Jimmy had the times he expected the first riders to arrive at the checkpoint, and when the checkpoint closed. The first riders were expected to arrive at my a.m. loop checkpoint at 8:20 - twenty minutes into the race. No watching the race start for me. I'd have to leave early to get there on time. Jeff, Russ and I headed out of Hammertown a early on Sunday morning. We got to our checkpoint, on SoCal Vista, before the race started. The first riders came through right at 8:20, just as Jimmy had predicted. Since our checkpoint closed after just two hours, we should have plenty of time to ride the 15 or so miles required to get to the start of our hike for the second checkpoint. Piece of cake. My nervousness began to subside. before we could corral him, he took off. It took a few minutes to get him rounded back up, and when we did, we found that he did not know how to get back to Hammertown without following the race course. We told him to just follow us. All of this delayed us by about 20 minutes, time we'd later rue having slipped by. We dropped off our racer at Hammertown. Jeff and Russ grabbed a quick snack while I looked around for the the folks I though were supposed to be heading out with us for the p.m. loop. After determining that they'd left, we mounted up and headed out. I knew that we'd have to hustle, but we still had more than 90 minutes to get in place. We arrived at the point where our hike began just as the race was starting. According to Jimmy's notes, the first riders should be arriving at checkpoint #4 some 65 minutes later. Since it took only 30 minutes to hike there, we were going to be just fine. Our hike involved a steep climb of about 400', followed by a hundred or so level yards across a ridge, then a descent for a few hundred feet into a canyon. I'd wondered, in the preceding days, if just walking the race course 200 feet up the hill, then following it along the same contour around the hill, might not be a faster way of getting to where we needed to be (it sure appeared that way on the topographic map), but was warned off. So up we went, running as fast as we could in motocross boots and riding gear. We beat our estimated time to the ridge by a few minutes, but were feeling gassed after a good hour of continuous movement. 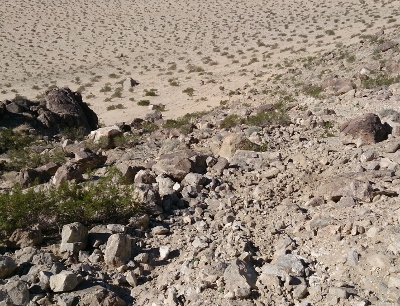 While pausing to catch our breaths, I saw Jimmy come riding across the ridge toward us. Clearly he was agitated. It was about then that we noticed the buzz of a helicopter approaching our position. Up until then, I'd assumed that there was at least one person waiting for us down in the canyon, and that we had plenty of time to join them. Jimmy's appearance, along with the helicopter and an approaching cloud of dust, heralded a change in schedule. We tumbled and rolled into our otherwise unmanned checkpoint just in time to record the numbers of the first wave of riders - 40 minutes ahead of Jimmy's original best estimate. Those folks were kind of good. We had quite a gaggle of riders arriving in the minutes after our checkpoint closed. Relief that their race was over was evident - all of them had had quite enough. Later, while watching POV videos from the race, I was struck by the fact that after the first ten or so riders, the event looked less like a race and more like a cooperative effort at survival. One particularly compelling video shot by one of the sweep riders, a talented desert racer, was just brutal to even watch. It took a while for race control to release us after our checkpoint closed. Since sweep was still going to be a while getting to our position, we decided to perform a public service and walk the course backward to look for errant riders. It turned out to be a 15-minute walk to our motorcycles. If I'd gone with my instinct, we'd have made it well before the first riders arrived and would have avoided getting chewed out. One hundred yards of mostly level trail was the difference between hero and goat. Jimmy was good when I handed him my logbooks after the race that evening. He told me that I looked good on Cody Webb's GoPro tumbling down to where I was supposed to be. I'm betting that it looked great on the Jumbotron in Hammertown. So that's the end my story about the 2014 KOM. I had a great time, even if I felt like a knob for being late. If the radio chatter I heard was any indication, I might not have been the only person. I think the first wave of riders was really much faster than anticipated. I maintain a profound level of respect for everyone in this race, and for everyone associated with it, for that matter. Jeff and Russ, wherever you are, thanks for your help. Sorry I got you fussed at, and see you next year! Yup, the trail goes through here, honest and no lie.